A confident performance from Blyth Spartans saw them make little of their long trek to Kings Lynn Town with a comfortable win. But there were spells in the first half where their hosts threatened. However, goals from Robbie Dale, Danny Parker and Dan Maguire sealed three valuable points for Tom Wade’s men. Spartans made the perfect start and went ahead after just a minute. Alex Nicholson was played into the right side of the area by Michael Richardson and capitalised on the hesitancy of Linnets keeper Alex Street to loop a cross to the far post that was met by a cool side foot volley from the unmarked Dale. That start could and should have got even better as Dale nearly grabbed a second in the third minute as Michael Richardson beat the offside trap and crossed for the winger, but he failed to make a meaningful contact and the chance went begging. The hosts composed themselves and should have grabbed an equaliser with their first chance of the game in the sixth minute. Jake Jones, who only returned to the Linnets from Halesowen Town on Monday, found some space 20 yards from goal and rolled the ball into the right hand side of the Spartans area but winger Stephen Spriggs could only send his first time effort horribly wide of Nick Thomson’s near post. Then in the 16th minute Blyth conceded a penalty. A loose ball into the area was picked up on by Jones and after taking an excellent first touch he was upended by a naive challenge from Ryan Hutchinson. Peter Winn stepped up to take the spot kick and sent Thomson the wrong way only to see the ball come back off the keeper’s right hand upright. But there was let off in the 20th minute as the home side did grab an equaliser. Winn was afforded too much time on the right and took full advantage by curling a cross to the far post to find Jones who scored from close range. Buoyed by their equaliser, Town came at Spartans again and should have grabbed the lead just before the half hour mark. Winn managed to squeeze a through ball in behind the back four to release Stevenson in on goal, but the striker sent a low drive wide of Thomson’s far post as the keeper closed him down. An action packed half continued to gather pace and Nicholson almost put Spartans back in front. The full back skipped past four weak challenges in the Linnets area but could only poke a shot at goal that was comfortably dealt with by Street. With just a minute to go until the break Jones had a great chance to double his own tally for the day and put his side into the lead. Again it was a cross from the right that caused the problems, but this time it was Stephen Spriggs with the centre. Again Jones escaped the attentions of Nicholson at the far post but failed to make contact with the ball. Spartans retook the lead just five minutes into the second half with a goal from Parker. A corner from the right by Richardson was met by the head of Matthew Wade at the far post, but the midfielder could only send the ball harmlessly wide of the near post. However, as the ball seemed to be heading out of play it was retrieved by Parker and the defender eased past a weak challenge from Conor Marshall and squeezed the ball just inside Street’s near post. Spartans had Thomson to thank for maintaining their lead shortly after Parker’s goal. A corner from the right fell to Stevenson on the far side of the Spartans area and the striker struck a rising volley that was expertly and acrobatically tipped over the bar by the keeper. With ten minutes remaining Spartans extended their lead with another goal from the in-form Maguire. A clearance from keeper Street held up in the wind and allowed Richardson to send a powerful header in behind the hosts back four that released Maguire and the striker blasted the ball left footed past the despairing dive of Street. Moments later Blyth were denied a penalty claim as Dale burst into the area and looked to play in Richardson, however, the outstretched hand of Ryan Fryatt prevented the ball from reaching the former Newcastle United man but the referee waved away the vociferous protests from everyone in green and white. The home side began to look disgruntled and Tom Wade’s side could have extended their lead twice before the full-time whistle. Firstly, substitute Dan Hawkins found some room 20 yards from goal and struck a dipping volley that was spectacularly tipped over by Street. Moments later Maguire was sent in on goal and cut inside the challenge of Eze but found himself closed down by Street, who smothered the striker before he had a chance to get the shot away. As referee Guest blew his whistle for full-time he brought an end to an impressive performance from Spartans. From back to front they looked alert, committed and most of all completely at ease with the style of play they are encouraged to play. Whether they are successful or not in their play-off push, even the most cynical member of the Green Army can not help but acknowledge the progress made this season. 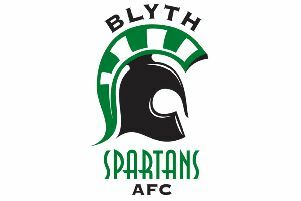 Blyth Spartans: Thomson, Nicholson, Watson, Hutchinson (Bramley 24), Parker, Hooks, Rivers (Hawkins 71), Richardson, Maguire, Wade, Dale. Subs not used: Lynch, Wearmouth, Turnbull.